We help remind your customers. The fully customisable contact management application provides a mechanism for sending automated customer reminders via email, SMS and direct mail, controlling operator calling lists, recording inbound and outbound call information and managing follow up data from various sources in one place. 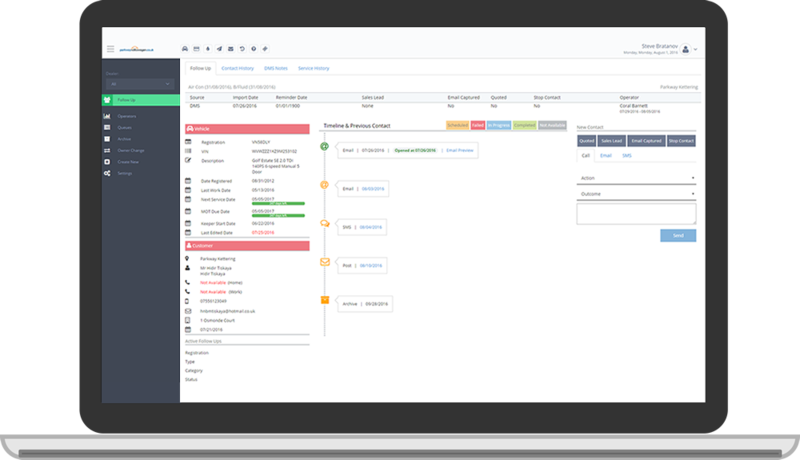 Send vehicle model and service specific communication to your customers, changing the content if the same method of contact is to appear multiple times on the fully customisable follow up timeline. There’s no need to print, fold, package and post your letters, we can do all of that for you with full edge to edge printing available and the option of sending a variety of post cards if you’d rather. Combine all of your follow up requirements into one system with varying timelines for Service Plans, iVHC records with Red and Amber work now due and data from your DMS* for upcoming services. Using data from the DVLA we can check if a customer still owns a vehicle since their last service or iVHC visit, meaning they don’t receive unwanted, often costly reminders. Use our customisable weighting facility to rank customers by loyalty, putting those customers that are most likely to book at the top of the calling list. When sending emails and letters to customers reminding them of Red and Amber work now due, include the full health check reports. Why not send a Thankyou letter or email from the Managing Director to your customers following a vehicle sale? Effectively and efficiently communicate with your Motability customers reminding them when their current contracts are coming to an end. Create one repository for all inbound and outbound contact attempts and details of conversations with your customers, meaning reporting on actions and outcomes is rich and accurate. By automatically detecting a future booking made in your DMS* we can close down any open timelines for a vehicle meaning unwarranted and unwanted communication is not sent to your customers. Each event, keeper change, forward booking, action and outcome are all recorded within the system, and with this comes the comprehensive reporting required to effectively manage inbound and outbound contact teams and plan future contact strategies. Should a letter be returned, the timeline from which it was sent will be updated with the reason for the return available for users to see and update your DMS accordingly. See if, when and by who an email sent from your follow up timelines was opened to provide a more in depth understanding of your customers preferred contact methods. reminder the day before they are due in. As and when a booking is made in your DMS, send an email or SMS automatically to include details of dates, times, collection information or courtesy car requirements. A day or two before the vehicle is due into your workshop, send a reminder to the customer to reduce no shows and also to bring documents should a courtesy car have been requested. gain insight into staff and dealership performance. Improve your Google ranking by allowing customers to post to your Google review page following completion of the questionnaire. Surveys that can be completed by the customer before they leave the dealership offer a great insight into experiences, and also allow issues to be resolved immediately. Choose different questions for a customer to answer based on their response to a previous question, requesting more detail should they mark a lower score for example. If a questionnaire is sent from iVHC then the iVHC record can be attached to the communication, so the customer has all information to hand to complete it. Rather than send electronic requests Via email, you could send questionnaires by post or on a post card. via bulk SMS or direct mail to promote upcoming events or offers. Include a short URL in the body of the SMS which, when clicked, links to a video created by your dealership which can be viewed on a smartphone or tablet device. Give your customers the option to request a call back from the dealership regarding the specific campaign to help monitor effectiveness. Contact information can be downloaded from multiple sources, cleansed and merged before being uploaded and sent to those in the list.